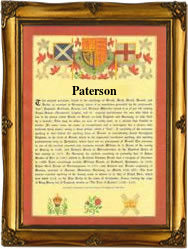 This distinguished surname, with several entries in the "Dictionary of National Biography", and having no less than ten Coats of Arms, is one of the most popular of Scottish surnames, and is a patronymic form of the male given name Pat(t) or Pate, itself a short form of Patrick. Patrick derives ultimately from the Latin "Patricius", patrician, or "son of a noble father", that is, a member of the patrician class, the Roman hereditary aristocracy. Patrick has been chiefly used in Ireland and Scotland, but was widespread in the North of England from the 12th Century, giving rise to a number of surnames including: Patrickson, Pate(s), Paty, Paton, Patten, Patti(n)son and Pat(t)erson. Its popularity in these parts was largely due to St. Patrick, 5th Century Apostle of Ireland. The original territory of the Clan Pheadirean (Patersons) lay on the north side of Lochfyne where they were formerly numerous. Early examples of the surname include: John Patonson (Aberdeen, 1446); Donald Patryson, burgess of Aberdeen (1495); and George Paterson, a monk in the monastery of Culross (1569). Emma Anne Paterson (1848 - 1886), who founded the Women's Protective and Provident League in 1874, was the first woman admitted to the Trade Union Congress in 1875. The Paterson Coat of Arms depicts argent, three pelicans feeding their golden young in nests vert, on a blue chief as many mullets argent. The first recorded spelling of the family name is shown to be that of William Patrison, which was dated 1446, witness in the "Episcopal Register of Aberdeen", Scotland, during the reign of King James 11 of Scotland, 1437 - 1460.